It can take many years and many millions of pounds sterling or dollars for new medications to come to market. Not only do the drugs have to work, but they also have to do so with an acceptable range of potentially adverse effects. Most feel it was a rash promise, with a massive political twang, to offer a cure for dementia by 2020. Certainly, it is hard to get very excited about this promotion of the pharmaceutical industry reported to have been ‘ailing’, while care in this jurisdiction due to swingeing cuts has been on its knees. Losartan is a medication, routinely used in management of high blood pressure. It is “an angiotensin receptor blocker” (also called an angiotensin-II receptor antagonist (AIIRA)). The renin-angiotensin system (RAS) is classically known for its role in regulation of blood pressure, fluid and electrolyte balance. Recently, several local RASs in organs such as brain, heart, pancreas and adipose tissue have also been identified. And the wide-ranging actions of such drugs have attracted much interest for much time (e.g. Goodfriend, Elliott and Catt, 1996). Losartan works by blocking the effect of a chemical called angiotensin II which is made in your bloodstream. Angiotensin II causes your blood vessels to narrow and also leads to the production of another chemical called aldosterone, which increases the amount of fluid in your blood. By preventing the action of angiotensin II, losartan reduces how much work your heart has to do and lowers your blood pressure. It also has a protective effect on your kidneys. The Dementias and Neurodegenerative Diseases Research Network (DeNDRoN) has worked in partnership with researchers on eight of the 21 studies announced by the government to receive funding, including the RADAR clinical trial. DeNDRoN will work with sites across the UK to actively recruit 230 participants for the RADAR clinical trial over the next two years. Those regions involved are Oxford, Leicester, Reading, Brighton, Exeter, as well as three sites in Scotland and one in Wales. With generous funding of nearly £2 million by the Medical Research Council (MRC) and managed by the National Institute for Health Research, the double blinded placebo-controlled randomised trial, known as RADAR (Reducing pathology in Alzheimer’s Disease through Angiotensin taRgeting), will recruit approximately 230 participants from a number of sites across the UK over two years. Among these locations will be the BRACE Centre at Frenchay Hospital in South Gloucestershire. This is a memory clinic under the direction of Dr Liz Coulthard, who is a co-investigator on the RADAR study but whose own research is also funded by BRACE. 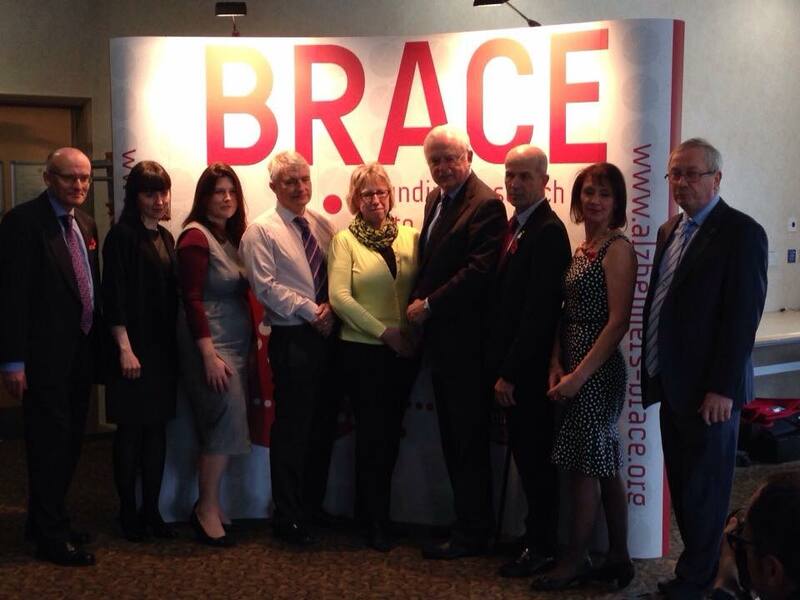 Dr Liz Coulthard was one of the speakers at the brilliant event held yesterday by Alzheimers BRACE. The study uses brain imaging at CRICBristol and other locations around the country to measure if losartan can help improve people’s memory and quality of life. This groundbreaking study was first reported in March 2013. But there is something very curious about the chemical at the heart of all this, for reasons I should like to explain. Angiotensin firstly is known to be a mediator of inflammation. This could be relevant to dementias such as Alzheimer’s disease in a number of ways. An excellent review (Benigni, Cassis and Remuzzi, 2010) looked at how studies in the last few years have however documented new roles for this molecule as a pro-inflammatory molecule and more recently as a possible pro-fibrotic agent that contributes to progressive deterioration of organ function in disease. Binding of Ang II to its receptors (in particular AT(1)) mediates intracellular free radical generation that contributes to tissue damage by promoting mitochondrial dysfunction. Blocking Ang II signalling protects against neurodegenerative processes and promotes longevity in rodents. In a separate strand of policy, a link has been made between obesity and dementia. Some scientists have found evidence that being obese in middle age raises your risk of developing dementia later in life, with the latest study suggesting that people as young as 30 who are obese may be at greater risk..
Intriguingly, according to Clare Wotton and Prof Michael Goldacre, obesity is associated with a risk of dementia in a way that appears to vary with age. Investigation of the mechanisms mediating this association might give insights into the biology of both conditions (Wotton and Goldacre, 2014). This is not where the story ends – but actually gets a bit complicated. As reviewed recently (Kalupahana and Moustaid-Moussa, 2012), Evidence from clinical trials suggests that in addition to anti-hypertensive effects, pharmacological inhibition of RAS also provides protection against the development of type-2 diabetes. Moreover, animal models with targeted inactivation of RAS genes exhibit improved insulin sensitivity and are protected from high-fat diet-induced obesity and insulin resistance. And there has been scrutiny of the remarkable suggestion that being diabetic might possibly increase your risk of dementia. It is thought that a third of Alzheimer’s disease, the most common form of dementia worldwide, can be explained by modifiable risk factors (Norton et al., 2014), so the argument of the effect of the environment can be overplayed. To give an example, researchers in Italy enrolled 120 outpatients, 54 males and 66 females, aged 75–89 years (mean age: 81.3 years) with mild to moderate essential hypertension. Using simple bedside tests of memory, the authors of that study data suggested that in very elderly hypertensive patients, chronic AT1 receptor blockade by losartan could improve cognitive function, in particular immediate and delayed memory (Fogari et al., 2003). And evidence from the part of the brain known to be a key player in memory, the hippocampus, suggests there may be something genuine going on here. Inhibition of central angiotensin II enhances memory function and reduces damage in rat hippocampus (Bild et al., 2013). It will now be very interesting to see if, given the relatively safe side effect profile of losartan, whether losartan can actually prevent the onset of Alzheimer’s disease, or slow its rate of progression. Certainly, losartan’s mechanism of action here is odd. But it is also extremely interesting. Benigni A, Cassis P, Remuzzi G. Angiotensin II revisited: new roles in inflammation, immunology and aging. EMBO Mol Med. 2010 Jul;2(7):247-57. doi: 10.1002/emmm.201000080. Bild W, Hritcu L, Stefanescu C, Ciobica A. Inhibition of central angiotensin II enhances memory function and reduces oxidative stress status in rat hippocampus. Prog Neuropsychopharmacol Biol Psychiatry. 2013 Jun 3;43:79-88. doi: 10.1016/j.pnpbp.2012.12.009. Epub 2012 Dec 20. Fogari R, Mugellini A, Zoppi A, Derosa G, Pasotti C, Fogari E, Preti P. Influence of losartan and atenolol on memory function in very elderly hypertensive patients. J Hum Hypertens. 2003 Nov;17(11):781-5. Goodfriend TL Elliott ME, Catt KJ. Angiotensin receptors and their antagonists. N Engl J Med. 1996 Jun 20;334(25):1649-54. Kalupahana NS, Moustaid-Moussa N. The renin-angiotensin system: a link between obesity, inflammation and insulin resistance. Obes Rev. 2012 Feb;13(2):136-49. doi: 10.1111/j.1467-789X.2011.00942.x. Epub 2011 Oct 31. Norton S, Matthews FE, Barnes DE, Yaffe K, Brayne C. Potential for primary prevention of Alzheimer’s disease: an analysis of population-based data. Lancet Neurol. 2014 Aug;13(8):788-94. doi: 10.1016/S1474-4422(14)70136-X. Wotton CJ, Goldacre MJ. Age at obesity and association with subsequent dementia: record linkage study. Postgrad Med J. 2014 Oct;90(1068):547-51. doi: 10.1136/postgradmedj-2014-132571. Epub 2014 Aug 20.